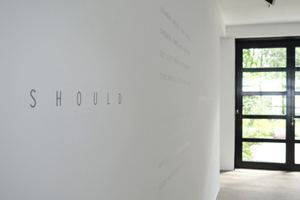 Galerie m Bochum has been working with the German poet Barbara Köhler (b. 1959 in Burgstädt) for many years. The installation “light” is her first solo exhibition, on view at the gallery from July 24 to September 19, 2015. WHAT IS LIGHT? AND SHOULD SOMETHING THAT IS HEAVY ALSO BE DARK? She transposes this insight to the field of language in order to shed new light on it, so to speak. Köhler draws here on the lexical ambiguity of the word “light,” which can mean both the visible phenomenon (Licht in German) and lightweight or easy (leicht). Thus, she alludes to a linear understanding of language, one that seeks clarity. At the same time, she highlights the many possible aspects of a word, which give rise to a variety of perspectives and lead to a complex overall picture. As an artist, Köhler also approaches light and color in terms of representation. 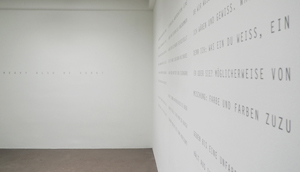 On the wall, which is dominated by three blocks of text, the poet deepens the discussion of light and our perception of it by using words and phrases like DARKFRAME, SCHWARZE KUNST (black art), LICHTBILDER (light-pictures, or photographs), WORTSCHATTEN (word shadow/s), EIGENGRAU (intrinsic gray) and then transitioning to WEISS (white / know) as UNFARBE (non-color), which according to the additive principle of color mixing emerges from the primary colors: FARBE UND FARBEN ZUZU/GEBEN BIS EINE UNFARBE ALLE ENT/HÄLT AUS IHNEN ENTSTEHT (color and adding colors/until one non-color contains them all/emerges from them). It is precisely this idea that mirrors Köhler’s understanding of language, which does not assume only one manifestation but instead implies a spectrum of meanings, grammatical functions, and material aspects of words. 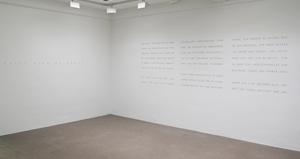 Barbara Köhler uses language as an autonomous medium. When reading her texts, the question of the right way to read them poses itself again and again. Versatile expressive possibilities and interpretations, and the associated flexibility, characterize her formulations. She frees language from grammatical conventions, one-dimensional readings and traditional contexts, creating new signification spaces, new text and sound pictures.